A restaurant in the famous New York Chinatown was visited this morning by the NYPD and federal agents, after an investigation showed the owners regularly killed dogs they found in the neighborhood and served them to customers. Agents of both the Food Safety and Inspection Service (FSIS) and the USDA’s Animal and Plant Health Inspection Service (APHIS) accompanied the police officers who searched “White Lotus Royal Buffet“, looking for dog meat. Large quantities of dog meat were found on the site and taken to a forensic lab to be analyzed. 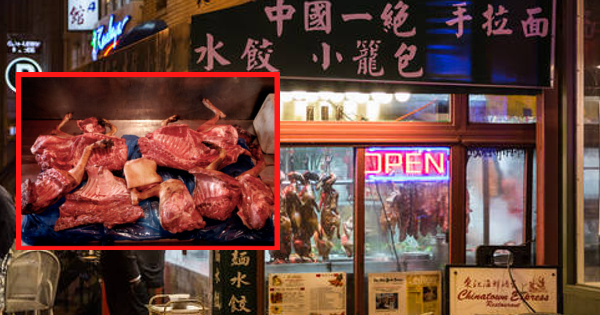 According to the NYPD spokesman, Captain Fred Jameson, the owner of the restaurant, Tengdo Hueng, admitted snatching dogs from the area with his 16-year old son and killing them for meat. Stray dogs have been disappearing for years in the Chinatown and Little Italy area of Manhattan, but pet dogs have also been disappearing since January 2016. A total of 12 dogs were reported missing on January 27, on the day before the Chinese New Year celebration. More animals went missing over the next months, and rumors of a “serial dog killer” began circulating in Southern Manhattan. According to the Humane Society of New York, more than 150 dogs have disappeared within a 1-mile radius of the restaurant in 2016, and almost 100 in the first months of 2017. According to police, the accused and his son hunted dogs with nets, lassos and crude spears, and could have killed hundreds of dogs. The NYPD believes the restaurant owner has been killing and cooking abandoned animals for years, but had to begin snatching dogs directly from their owners’ backyards when his business expanded. Despite this large quantity of missing animals, the police has only been able to charge Mr Hueng with the killing of 11 animals. He now faces a total of 47 criminal charges and a maximum of 95 years in prison. He should appear in court in June.